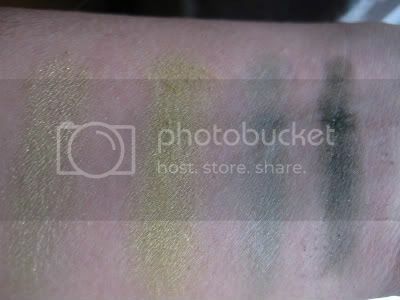 Hawkwind - a soft yellow green highlight colour, gorgeous! Gunner - dark green with light green glitter. The texture of this one reminds me of MAC's velvet eyeshadows. See below for my review of this palette. 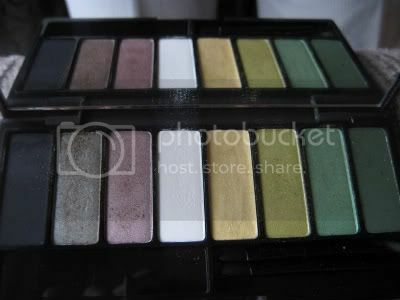 Pros: I think this palettes is pretty good for the price. I don't have a lot of palettes so this was a nice addition to my collection. The colours have decent payoff especially the green brown and plummy one. I also like the size of this palette, it's not bulky and will fit in my smallest clutch. Cons: The gold colour is cream and does not dry to powder, so it dosesn't last as long as the other ones. The colour payoff on these is hit and miss, some are not as good as others. Overall, I'm impressed with this palette. I will definitely look more into Kat Von D's stuff at Sephora. I hear the lipsticks are very good too. 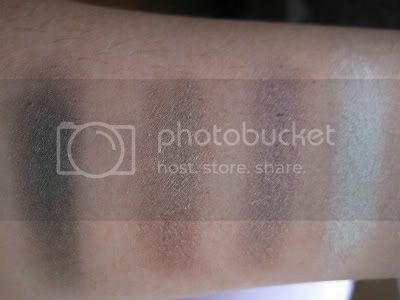 Here are some swatches on my arm with no base. 0 Responses to "Kat Von D Gypsy Palette"
FOTD and embarassing moment in my day! I'm wearing makeup eventhough my eyes are red!